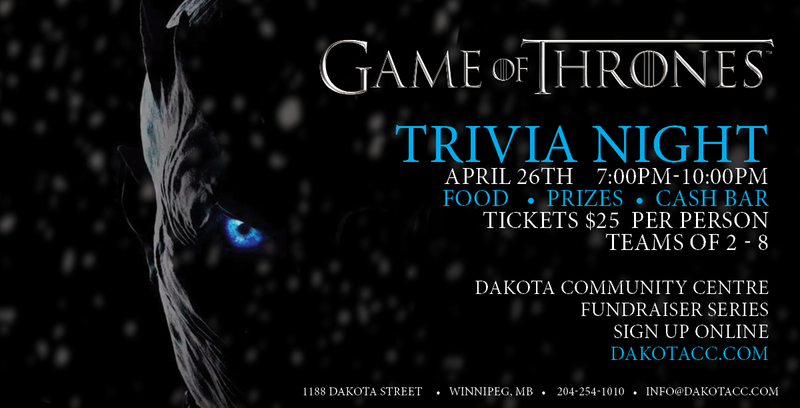 Game of Thrones Trivia Night! Join us on Friday, April 26th for Trivia Night! Hosted by Mandy Shew from 103.1 Virgin Radio! Tickets are $25 - proceeds will go toward Dakota's programming for children, adults and older adults! Questions will be from the popular HBO show and include images, clips and sound bits. Enter in teams of 2 - 8 people. Doors Open: 6:30pm - Grab food, drinks and get ready for trivia! Break Time: 8:30pm - Tally up the first half of questions! Grab another round of drinks and see where your team stands! Last call for 50/50. End of Questions: 9:30pm - Find out who are winners are! Great prizes will be awarded to our winners and some bonus ones throughout the night. 3. Bonus questions and mini games! 4. Grand Prize for our trivia winners!